Blessed olive oil is dripped onto the baby's head during baptism. A Greek Orthodox christening is a joyful celebration of new life that dedicates an infant to the service of Christ. In fact, Greek Orthodox babies are not even officially named until the christening ceremony. On such a momentous occasion, it is appropriate to give a gift that honors the child, his or her family, and the Greek Orthodox faith. Any godparent would treasure a framed portrait of the baby. Godparents are an extremely important part of a Greek Orthodox christening and typically receive a gift from the baby's parents. Popular gifts include a picture frame for a photo of the baby; something for the home, such as an attractive throw or rug; a book that matches their interests; and a small keepsake from the christening ceremony, such as an embroidered section of the baby's oil sheet or towel. Almonds covered with sugar symbolize the bittersweet-ness of life. It is traditional in Greek Orthodoxy to give small gifts or favors to guests at the christening ceremony. These gifts are customarily boubouniera - a small bunch of sugarcoated Jordan almonds wrapped satin or organza. However, if the parents are less traditional, they may opt to give the guests, for example, small photos of the baby or miniature crosses engraved with the baby's name. An attractive keepsake can grace the family shelves for years to come. Greek Orthodox christening gifts for the baby's parents are usually symbolic, rather than practical, and generally given by very close friends and family members. 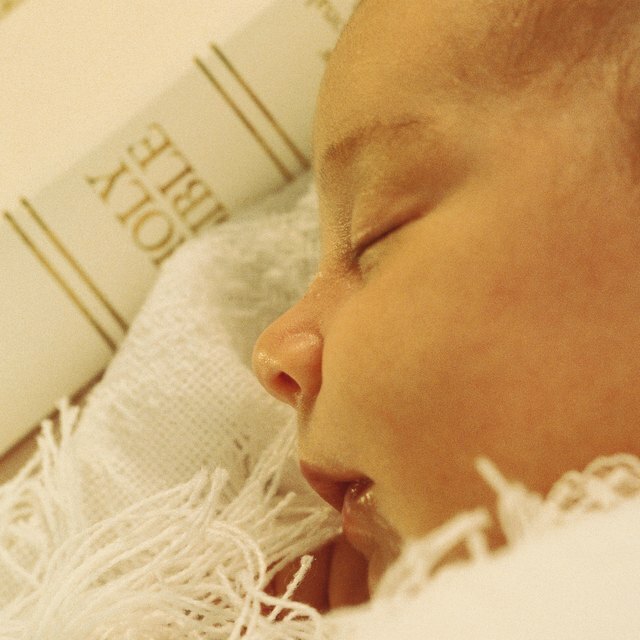 For example, an attractive leather-bound Bible, a silver or pewter rattle with a personal engraving, and a silver spoon are possible gifts for the baby's parents that can also serve as keepsakes. However, if the parents request that gifts not be given, a donation to a charity of the parents' choosing can be a lovely and meaningful option for commemorating the christening. Wooden blocks are a classic favorite baby gift. Non-family members often opt to give practical gifts that can be used right away. Some examples include baby clothes, baby linens (such as towels and washcloths), a wooden puzzle, a stuffed animal or other baby-appropriate toy, and even money. 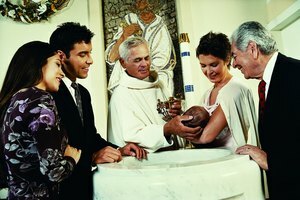 Some parents opt to create a christening gift registry so that guests can choose something sure to be of use. Traditionally, godparents gift the baby's christening gown and a gold cross; however, it is also appropriate for the godparents to assume all christening costs or to take on just a portion of the costs determined by the parents. Bradley, Kate. "Greek Orthodox Christening Gifts." Synonym, https://classroom.synonym.com/greek-orthodox-christening-gifts-12087049.html. 29 September 2017.